What a difference a day certainly makes. Yesterday, I couldn't even get out of the street as the roads were dangerously icy, as well as the pavements. There was no grit put on the roads where we live as our roads are not a priority, understandably so. The only cars just about moving were 4 bx 4 cars, SUVs and vans. D did try to leave in the early hours of the morning, but the wheels on the car just turned and screamed on the ice. From the window. I observed other neighbours try too - but eventually give up, which I think was wise rather than have an accident on icy road conditions. I rung in with my genuine excuse and had to take it as a 'holiday'. It was back to work today and there was no sign of snow or ice, yes what a difference a day makes. Tempeh is a popular fermented soy cake. It has been eaten for hundreds of years in South East Asia, particularly in countries like Indonesia where dishes like Oseng-Oseng and Tempeh Bacem are popular. However in the west, tempeh has become a vegetarian and vegan substitute for meat, often found on a breakfast plate replacing bacon. Here I am trying to use it in its own right as an additional ingredient. The tempeh in this Black Turtle Beans Chili made for a pleasant change. Neither of us are that keen on tempeh, but we enjoyed the texture it added. We not only enjoyed it over white Basmati rice, but also as Enchiladas and also straight out of a bowl with a spoon. Do you have any favourite recipes that you make with Tempeh ? Please let me know. I am sharing this colourful bowl of Tempeh Chili with Black Turtle Beans with Soups, Salads and Sammies hosted by Kahakai Kitchen. 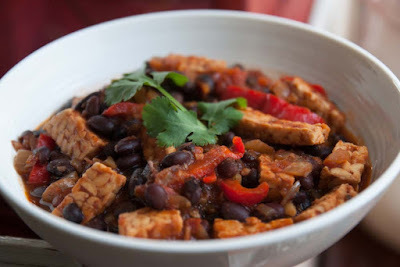 and with Motions and Emotions is hosting MLLA My Legume Love Affair this month as this dish contains not only black beans, but the tempeh is made with soy beans. MLLA was started by The Well Seasoned Cook and now run by Lisa's Kitchen. Heat the oil in a wide pan, and then fry the onion for 10 minutes until soft, then stir in the garlic and spices and cocoa powder. Stir in the chopped tinned tomatoes and cook on medium heat until the tomatoes have fallen apart. Stir in the beans and the stock and bring to the boil, then reduce the heat and stir in the pepper and tempeh and simmer for 45 minutes until the sauce has thickened. tempeh at least looks more interesting than tofu! A perfect comfort food dish! I can't believe you had to take the day off as holiday when you couldn't get in even if you wanted to! We get some of our roads gritted, but never the pavements, so I get too scared to walk on them in case I do myself a mischief. I ended up taking the day off too. 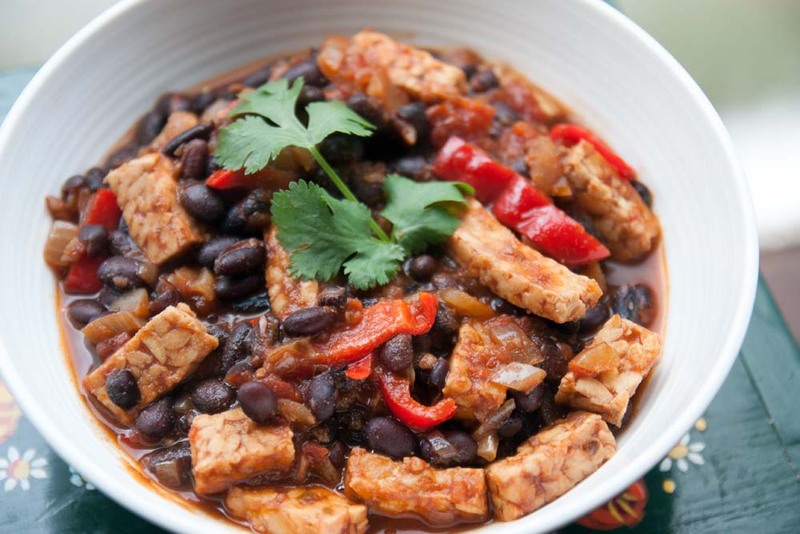 Tempeh and bean chilli sounds like a tonic for cold weather. I know Joey - just the way it is and the snow impacted on me more as i live in the Welsh valleys, all the other workers live in the towns, so did not feel the impact of the snow the same way. When we had the 'Beast from the East' the whole office closed down for work - just the way it is I guess.I was still happier not to go in than damage myself on the ice, which I was really concerned about. We have to take days as leave if we can't get in too, although fortunately in the recent bad weather there were enough trains running to get me to London (and my workplace were accommodating and encouraging of shorter days if needed). At least you got this lovely dish! Thanks Kari. When we had the 'Beast from the East' the whole office closed down for work as it impacted most of the workers, but when you live in the valleys and commute into the city, employers and other colleagues are not so sympathetic so its easier just to take it as a 'holiday' just the way it is I guess in the UK. 8oz block of tempeh crumbled into a saucepan with 1/2 cup water, soya sauce, salt and pepper (and Hendos if to hand). Simmer for ten minutes. Cool. Add dried thyme, oregano, ketchup, English mustard, black pepper, half of an onion, finely diced, garlic, crushed, half a cup of panko bread crumbs. Combine. Check seasoning. Pan fry in a reasonable amount of olive oil. Have some burnt bits. Serve with spaghetti and a good tomato sauce. Great.